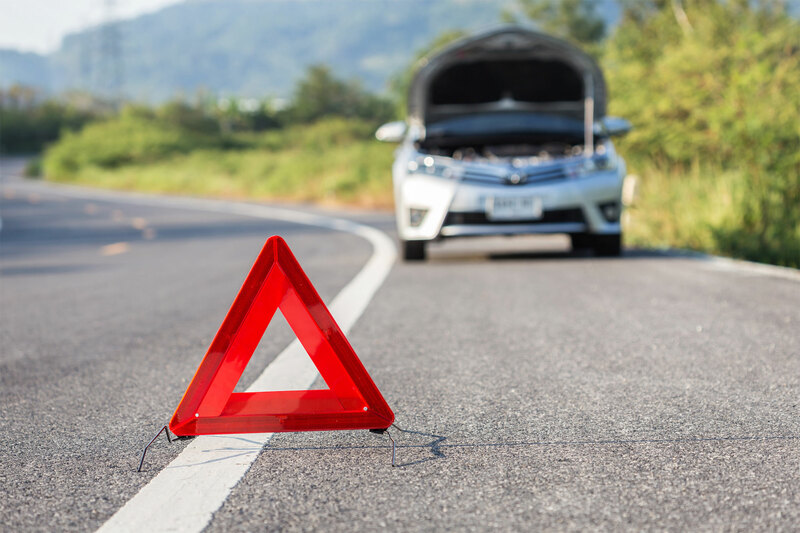 Whether you’re dealing with a flat tire, a minor car accident, or a dead battery, it’s important to stay safe while waiting for roadside assistance or towing service in Las Vegas. Breaking down on the side of the road can be scary and it can be dangerous with distracted drivers who may not see your stalled car or you. These tips will help you stay safe in an emergency while you wait for a Las Vegas tow truck company to arrive. If your vehicle can be driven safely, drive to the shoulder of the road so you aren’t blocking traffic. Avoid parking on a hill or blind corner where other drivers will have trouble seeing you. If you aren’t able to drive the car and you can do so safely, get help pushing the car to the shoulder. As soon as your car experiences problems, turn on your hazard lights to make your car more visible and help alert other drivers to the fact that your car isn’t moving. If you have an emergency kit in your car, you can set up cones or flares to make yourself more visible. In most cases, it’s safest to stay in your car with your seatbelt on while waiting for fast towing in Las Vegas. Don’t stand next to your car as you don’t want to bet your life on other drivers paying attention. If your car is sideswiped or hit while on the shoulder, you’ll be safer inside with your seatbelt on. There may be times when you feel it’s safer to get out of your car, however. For example, if your car is smoking or you are stuck in an area where you are likely to be hit, but there are currently no cars on the road, it may be safer to leave the car. If you’re on the shoulder of a highway, exit through your passenger side. Never stand in front of or behind the vehicle. Watch for traffic and keep your eye out for any dangers, especially passing cars. Keep an eye on your car to watch for signs that you need to leave, such as smoke coming from the engine. If you do leave your vehicle, make sure you take your personal belongings with you, including insurance information, important documents, and your purse or wallet to prevent theft or damage. You teach your children to never accept a ride from a stranger. Make sure you don’t put yourself in a similar situation. Avoid speaking to passing pedestrians or motorists while you wait for the towing service. While some people may simply be good Samaritans who want to help you, other people may have bad intentions. Just let anyone who asks know that you have already called for a towing company in Las Vegas and you do not need their help. When you call a towing company in Las Vegas, ask the dispatcher to give you the license plate of the truck that will be coming and the name of the driver. This is just an easy way to verify that the person who arrives is with the company you called. While this may sound unnecessary, it’s always better to be safe side.